Above left: Although the Morality of the Old Testament Covenant is not to be rejected, (Jn. 13:34,) Jesus commanded in Jn. 4:21-24, “[After the cross and Pentecost, true believers] will worship neither on this mountain, [this denomination or that one,] nor in [physical] Jerusalem. God is Spirit, and [all Scripturally, spiritually born again believers in Jesus] will worship the Father in Spirit and in Truth, [the truth of His Word in the Bible as taught by the Holy Spirit of Truth dwelling in them,]” (1 Cor. 6:18.) This is so because God’s Old Testament Covenant with the Old Hebrews was done away with at the cross to establish Jesus’ eternal, unchangeable, New Testament Covenant with believers from across the whole globe, (Jn. 3:16; Heb. 8:13 & chapters 7-9.) Thus, the Kingdom-Now-here-on-earth doctrine is a great deception. THE BIBLE IS INCORRUPTIBLE IF INTERPRETED EXEGETICALLY AND CONTEXTUALLY! Someone explained the difference between correct and incorrect interpretation of the Scriptures as follows, “Exegesis and eisegesis are two conflicting approaches to Bible study. “Eisegesis means that the interpreter is led to his own conclusions by vaguely or broadly following the text” while always loosening specific verses from the true context of the passage, Testament, etcetera, to fit them into certain doctrines. 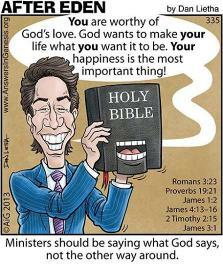 All church doctrine are based on Eisegesis, or forcing the Scriptures to say whatever they want people to hear. Hence, the many denominations or church divisions that sprang, (and is still springing,) from their spiritual mother, Roman Catholic Christianity. Sadly, in our day, the truth of, and obedience to the full context of Biblical Scripture is progressively exchanged for “rhema” or the spoken word: so-called “revelation knowledge,” which does not fit into the context of Biblical truth. Such extra-Scriptural ‘revelation’ usually comes from self-ordained ‘angelic’ and ‘divine’ apostles and ‘prophets’, where reliance on the True Word of Christ is replaced by the false authority of so-called ‘divine’ christ-men and women, who bind people to lukewarm religious comfort zones, false church systems, and false spiritual authority. “All truth” always pertains to the entire contextual truth of God’s Word, as well as to the entire truth concerning our particular situations in this world. Consequently, the Spirit will never lead us outside the protective, punitive Word or will of God, which can only be understood according to the truth of His entire, exegetically interpreted Word. Nevertheless, all Christians and Christian affiliates such as Jehovah Witnesses and Seventh Day Adventists claim to be ‘Bible believers.’ Therefore, we need to determine what true, Scriptural faith, and real Scriptural obedience actually mean. In addition, we must be vigilant against all forms of deception, stand firm in the truth of Christ, and always be on our guard against the schemes of the evil one. It is foolish to believe that the Spirit will manifest Himself in ways that violate God’s exegetical and contextual truth, our God-given free will and intellect, and our Holy-Spirit gift of discernment, (Rom. 12:1-3; 1 Cor. 14:32-33; 1 Pt. 1:13; Jam. 1:21-22; 1Pt. 5:8-9. ) The Holy Spirit of Truth will never lead us into false doctrine, disobedience to the contextual truth of Scripture, chaotic spiritual manifestations or, as found in traditional Catholicism and Protestantism, the lack of Scriptural manifestations (or the Gifts) of the Holy Spirit. As soon as we accept teaching, prophecy, miracles, etcetera without asking who is speaking into our human spirits and souls (or minds,) and what are actually said and done here, we open ourselves to deception. · Mere feeling and human trust will surely deceive us. Therefore, ‘good feelings’ and human beings by themselves and according to manmade religious structures, cannot lead us into all truth. For instance, when Roman Catholics knowingly or unknowingly worship ‘Mother’ Mary as the Holy Spirit, most never ‘feel’ condemned. This proves that we cannot test the spirits through our feelings and/or by the insistence of church clergy to submit to church doctrines and ceremonial practices. Many people do not realize that God did not use any of the Bible writers as computers or secretaries. The Holy Spirit inspired God’s authors to write the Scriptures on paper; He did not dictate every word to them. So, early Bible writers certainly interpreted God’s inspired Word and the historic events of, (for instance,) Jesus’ crucifixion and resurrection in the light of their Hebraic views. In addition, it is a reality that some ‘discrepancies’ can be found in both Old and New Testament Scripture because Roman Catholic and Protestant church clergy also manipulated the Scriptures to justify their doctrines, just as pastors and ministers of all sorts are still doing today. As a result, the Bible, as any other book, cannot be interpreted verse-by-verse. It would be futile to seek the truth of Scripture (or anything else) by focusing on certain verses from the Bible without considering the “entirety” or real context of Biblical truth — while that is exactly what all Christian denominations do. Nevertheless, it is shockingly true that everything the mother of all Christian churches, the Roman Catholic Church, touched, (referring to Christian doctrine, church forms, norms, unscriptural sacraments or ‘salvation’ through church rituals, etcetera,) were tainted by, and derived from the Vatican’s ‘Christianization’ of barefaced paganism. Sadly, Protestants such as Luther and John Calvin did not repent from Roman Catholic witchcraft, but simply “reformed” the most important doctrines of Roman Catholicism to suit their taste. Thus, the Reformers’ doctrines, churches, and hierarchies mimic Roman Catholicism to this day and still remain active in all their denominations or Christian divisions. In the process of ‘reforming’ from Roman Catholicism, Protestant leaders also changed, added, twisted, and omitted many verses from the original Scriptures to match their false doctrines, as evidenced in comparison between old and new translations of the Bible. In studying the Scriptures, we need to ask continually, How does a particular Bible verse, chapter, epistle, or book fit into the rest of Scripture? For instance, was it written specifically for Old or New Testament believers, or can a particular verse or passage relate to both the Old and New Testament Covenants? Confusing and blending the two separate Testaments or Covenants of the Bible with each other led to almost all false doctrine. And false doctrine, in turn, caused all the many divisions or denominations of Roman Catholic birthed Christendom. When studying the Bible, we must remember that the Old and New Testaments are two completely different and separate Covenants. In the Old Testament, everything pertained to the physical nation of God, the Old Hebrews; the physical Hebrew temple with its physical, hierarchical priesthood, ritual and sacramental laws and sacrifices, etcetera. In the New Testament, Jesus fulfilled the Old Testament Law, (both the Ceremonial and Moral Law, Mt. 5:17,) in its entirety for all those who would sincerely believe in Him, accept Him personally, and follow Him obediently, (Jn. 1:12-13; 3:3-5; Gal. 4:6.) Thus, through the New Testament Covenant, Jesus spiritualized everything that was physical under the Old Testament Covenant. For instance, Jesus bought with His blood-atonement a newborn, spiritual nation and priesthood from every tribe, tongue, and nation in the world. 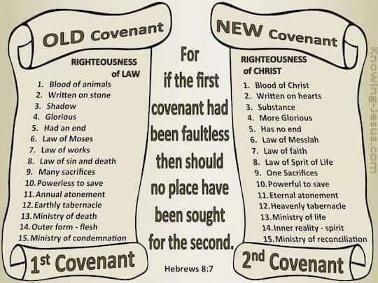 The one and only, New Testament/Covenant temple of God the Holy Spirit now resides in the innermost, born again hearts or spirits of all sincere believers everywhere, and so forth. · To understand the context of a particular passage or verse from the Bible, it is also vital to ask, What were the writer’s historical/traditional background and his human mindset at the time it was written? How is it relevant to the overall picture of the Scriptures today? Interpreting the Bible Exegetically, or Forcing the Bible to Speak Church Dogma Eisegetically?